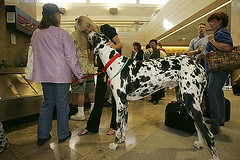 Itchmo: News For Dogs & Cats » Blog Archive » Is That a Horse or a Dog? Is That a Horse or a Dog? Sometimes I’m amazed over how tall dogs are. Well, Gibson, a five-year-old Harlequin Great Dane, is the world’s tallest dog and will be at America’s Family Pet Expo in Costa Mesa, CA this weekend. Gibson measures more than 43 inches from the floor to his shoulder and weighs 170 pounds. He can stand more than 7 feet tall on his hind legs. Gibson has been on the Tonight Show with Jay Leno, Oprah and Ellen DeGeneres. Gibson is also the spokedog for the Veterinary Diagnostics Institute (a company that detects heart disease in dogs) and at the expo, Gibson will be promoting the Canine CardioCare blood test. I’m glad that Gibson is using his celebrity status for good. This entry was posted on Saturday, April 14th, 2007 at 9:00 am	and is filed under National Dog, Cat & Pet Info, Dogs, Los Angeles, Events for Pets & Owners, News for Cats, Dogs & Owners, Veterinary/Medical. You can follow any responses to this entry through the RSS 2.0 feed. Both comments and pings are currently closed. Thats a big dog/small horse. however wolves can reach sizes even larger. 4door automobile?? it was absolutlely HUGE!! our domestic pets are small by comparision to wildlife..
(i would not want the feed bill for that 1)..